Your receipt of an electronic or other form of order confirmation does not signify our acceptance of your order, nor does it constitute confirmation of our offer to sell. WM Filter reserves the right at any time after receipt of your order to accept or decline your order for any reason or to supply less than the quantity you ordered of any item. 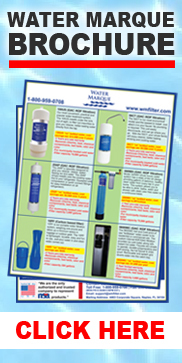 To keep you informed about our latest offers, we may notify you of current promotions, specials and new additions to the WM Filter. You may unsubscribe from our newsletters by following the unsubscribe instructions in any email you receive from us. (1) please send back the item, via a traceable service (USPS signature required), UPS, Federal Express - Customers will be responsible for shipping charges inbound and outbound**. (4) be requested within 15 days from the date of purchase, and, is subject to a 20% restocking fee. S&H for authorized returns is paid for by the buyer. Return Credit is only applied to subsequent purchases from Water Marque (store credit). Any items purchased on sale are considered Final Sale, these items are not able to be returned for store credit. We cannot guarantee when an order will arrive. Consider any shipping or transit time offered to you by WM Filter or other parties only as an estimate. We encourage you to order in a timely fashion to avoid delays caused by shipping or product availability. WM Filter shall automatically charge and withhold the applicable sales tax for orders to be delivered to addresses within Florida. For orders shipped to other states, you are solely responsible for all sales taxes or other taxes.